Thought the eating was over since we’re done with the holidays? Think again. Not only do we have Mardi Gras to indulge in, we’ve also got Restaurant Week Baton Rouge starting next week, January 13-18. DIG Magazine was genius in starting this event because we obviously have some of the best food, restaurants and chefs around who deserve a week dedicated to them. The first two Restaurant Week’s were extremely successful—one taking place in January 2013 and the other July 2013—and we expect nothing less than great for next week and years to come. If you haven’t dined out during Restaurant Week before, here’s a little bit of background on the six-day event. Restaurant Week Baton Rouge is a bi-annual event where 30+ restaurants are showcased across the city with 3-course meals fixed at prices from $15-35 per person. Not only can you enjoy a delicious meal, but you are also giving to a great cause. A percentage of the proceeds from Restaurant Week are donated to the Greater Baton Rouge Food Bank. In 2013, the two combined Restaurant Weeks raised $10,000 for the GBR Food Bank. “Each $5,000 donation will provide 35,000 meals for those in need in our 11-parish service area," said Mike Manning, president and chief executive officer of the Greater Baton Rouge Food Bank. Eat and give this year. Below you will find links to all participating restaurants and their menus. Tell us...where are you most excited to dine? Which menu looks best? 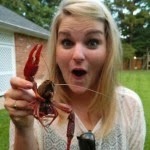 Christy Chachere is the Communications Coordinator for Visit Baton Rouge. Born and raised in Louisiana, LSU grad and now promoting our great city day after day. She loves all thing Louisiana and southern! You can find her tweeting, facebooking, pinteresting, instagramming and much more for us! #GoBR!